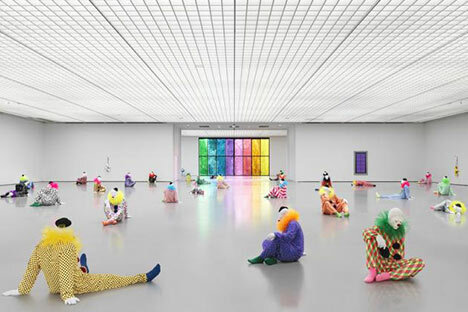 "Ugo Rondinone: the world just makes me laugh" incorporates imagery and themes from popular culture as well as drawing inspiration from historical art movements such as Romanticism and Surrealism. Seemingly lighthearted motifs including rainbows, clowns, and clown shoes take on a melancholy tone in this riveting and psychologically intense installation. Rondinones nuanced use of space, scale, color, and pose contribute to a brooding sense of the sublime. The joy and wonder of childrens drawings of rainbows, for example, are counterbalanced by the formal and emotional weight of the sheer number of images. The BAMPFA exhibition also features several related works, including Rondinones sixty-drawing series 1998 diary; four pairs of clown shoes; eight large-scale paintings from the artists sun series; an oversized light bulb sculpted from wax; and thousands of drawings of rainbows made by children from all over the world, including Berkeley. Organized by BAMPFA Director and Chief Curator Lawrence Rinder.